Through the ages the beautiful town of San Gimignano has had a variety of names. Apparently the origins of the town date back to when two aristocratic brothers fled from Rome and settled in the area of Valdelsa where they each built a castle; one of them on the hill where San Gimignano now stands. The brothers decided to give their castles names and one of them chose ............Silvia. This distinctly Pythonesque choice conjures up (for me at least) an image of Eric Idle and Terry Jones, dressed up Roman garb, reclined on a hill side and reviewing their handy work. ‘Well Eric, your castle is looking good, whadya gonna call it?’ ‘Not sure brother mine, I was thinking of the Castle of Fear or the Castle of the Forest ...... but maybe I’ll just call it......Silvia’. Eric looks a bit wistful and sighs heavily looking off into the distance, could Silvia have been a woman? Whatever the reason behind this unusual choice it didn’t last and town was later named after Saint Geminianus (also a slightly unfortunate name) who saved Silvia from being destroyed by Attila the Hun. Lucky escape! Later on there was a frenzy of family rivalry in San Gimignano and, towards the end of the medieval period, no less than 72 tower houses had been constructed in the town, some of them up to 230 feet tall! It isn’t hard to imagine how this medieval form of ‘mine is bigger than yours’ got a little out of control amongst the local nobles. So much so that height restrictions had to be implemented by the local authorities who deemed that none of the towers could be higher than the tower adjacent to the ‘palazzo comunale’. If I am not mistaken the same thing happened with cod pieces; they became so ridiculously large that their size had to be restricted. But enough of that, here are some interesting but irrelevant facts about San Gimignano. A fictionalised version of San Gimignano (called Monteriano) is featured in E.M. Forster’s 1905 novel, Where Angels Fear To Tread. Also, a character in the John Grisham novel, The Broker, rents a 14th century monastery near to San Gimignano. Tea With Mussolini was partially filmed in San Gimignano and Franco Zeffirelli used it as a stand in for Assisi in his 1972 biopic Brother Sun, Sister Moon. 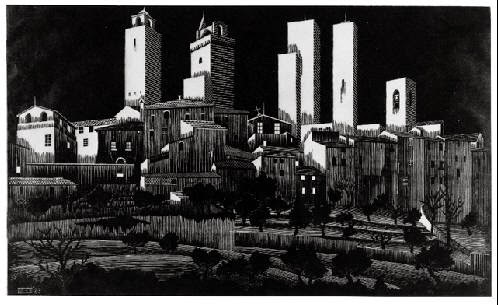 Escher’s 1923 woodcut depicts the towers and a 15th century version of the town is featured in the 2009 video game, Assassin’s creed.